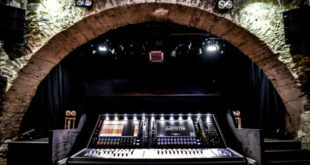 In a bid to stake its claim in the pro audio market, Behringer has launched the ProZone in North America; a focused line of products aimed at production and rental companies, AV and professional sound reinforcement applications. Comprised of the company’s X32 digital console, S16 digital stagebox, P16 personal monitoring system, ELX vertical line array speakers and iNUKE high-power amplifiers, the ProZone line-up is designed to offer all of the components necessary to stage high-performance sound in a variety of portable and fixed applications. ProZone specialists have been dispatched on a North American tour in a fleet of branded trucks aimed at bringing the pro products directly to dealers and end-users alike. ProZone products will be demonstrated at a series of events across Canada and the US throughout the summer and into fall at Behringer dealers, festivals and concerts. Fully equipped ProZone trucks will bring full ELX line array speaker systems with multiple X32 consoles to each location in support of each event. Behringer product specialists and product managers will be on hand to set up, operate and explain all aspects of the products and their applications. A full schedule of events is posted at behringer.com/prozone. Dealers, venues, houses of worship and professional customers can schedule demos by emailing MARKProdBU1GLOB@music-group.com or by visiting the Behringer ProZone website at behringer.com/prozone.